Quintessential New York scenes—everything from silhouetted rooftop water towers to the illuminated Chrysler Building at night. 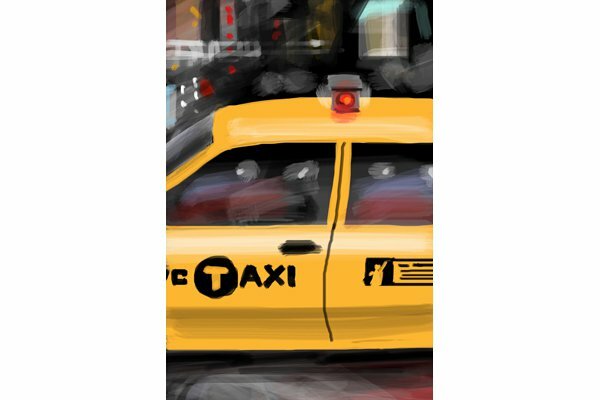 It's hard to keep a New York City taxicab in the same place for very long, so I just stood on a Times Square corner and painted a bit of each car that stopped at the red light. This must be a composite of about fifty taxis. They are not that different one from the other. 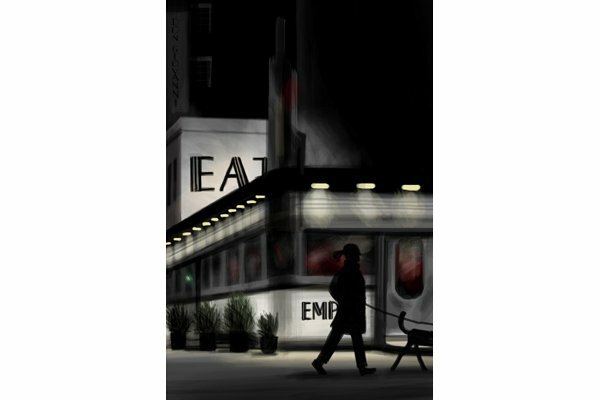 "Tenth Avenue and 22nd Street"
Vintage diners like the Empire are a bit too anachronistic for me. Sure, they're relics to preserve, but they hold too much nostalgia to continue to function as icons of banal, pedestrian, all-American basic food. They're period snapshots, like early Tom Waits. For as many misgivings as we may have about it, the contemporary equivalent of diners may be joints like Panera or Au Bon Pain or Chipotle. We have long since entered the chain era, and there's little to do about it. This drawing made it quite quickly to the cover of The New Yorker, and I suspect it had to do with it being an almost-black-white piece. The magazine has always had a thing for color restraint. As for the Empire, which had inspired countless pieces of art before my own contribution, it closed a few months after its cover moment. 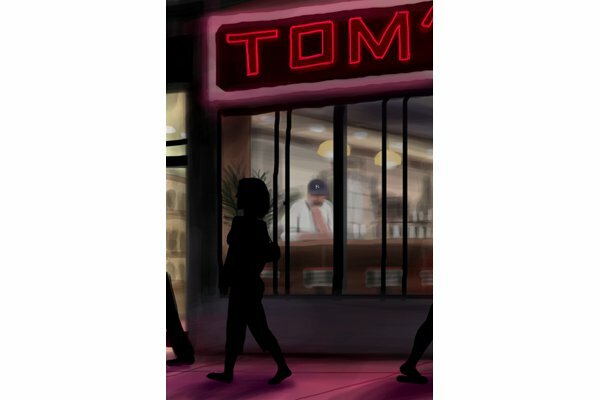 Tom's Restaurant used to appear often on TV (only the "Restaurant" half of the sign). I had first heard of it, though, through that Suzanne Vega a capella song that spawned countless remixes. The red and pink neons of the sign are so blinding, I totally forgot the background is really blue, not black. Doesn't look like it in the nighttime. 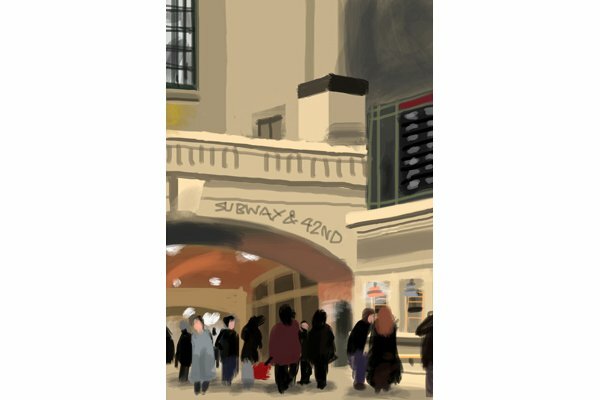 Grand Central is one of the most spectacular, theatrical settings in New York City. Unlike the people scurrying through the messy, contrived traffic patterns of the disastrous Penn Station, commuters in Grand Central's atrium are compelled to play their bit parts in the travelers' ballet — be it the massive dance of rush hour or the solo sprint down the ramp of a late-night straggler catching the last train. Back when I lived in Chicago, I frequented many hot dog stands. There they fill up the bun with a lot of trimmings: onion, relish, sauerkraut, and so on. So, as an ex-Midwesterner I feel something lacking in the starkness of New York-style, or should I say Coney Island-style, hot dogs. 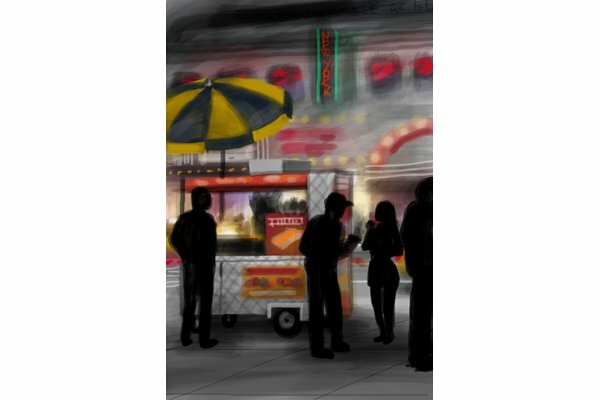 But, considering that this painting made it onto the cover of The New Yorker as the first digital cover created in the very contained and restrained context of an iPhone, it makes sense that it depicts NYC's classic mini-restaurant on wheels. The A line makes a complex connection between Manhattan and the JFK airport, so the odds of bumping into luggage are always a tad higher here than on other lines. Sneaking over someone's head or shoulder to consult the subway map is a minor urban etiquette conundrum. On my way to this location I Googled and downloaded the poster still from , Keaton and Allen watching the sunrise from a bench that is no longer there. My light was wrong, my format was off — Gordon Willis was absolutely correct in shooting the movie in the most possessive widescreen ever. Still, because I saw Manhattan many years before I ever visited Manhattan, my notions of the city were shaped in no small way by those grayscale images. And of such memories are these pilgrimages made. You can add or omit details in a painting and nobody will ever find out. Most of the images in this book are faithful depictions of a witnessed scene, down to the lighting conditions (something I used to change liberally back in the days when I worked in watercolor). Landscape elements may be glazed over or pushed forward, and proportions are often fudged, but the final results aren't that far from reality; and the characters depicted are for the most part people who stepped into the image while it was being made (even if they were altered or became a composite of several people). 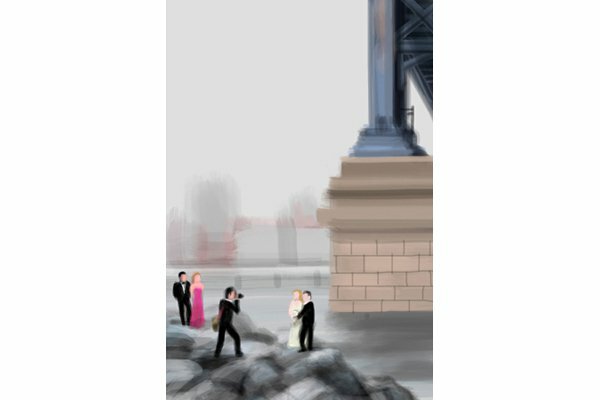 The things this particular drawing doesn't show are, for instance, that it was drizzling that day, causing the photographer to shelter his subjects under the Manhattan Bridge; that the bridesmaid and the best man were holding umbrellas; and that there was nobody else in the party to be photographed. It was a private, happy moment in the rain. But I'm sure the photographs looked great with Gotham on the horizon. Like any stereotypical New Yorker, you can often find artist on the side of the street, eyes glued to his iPhone, finger tapping away at the screen. 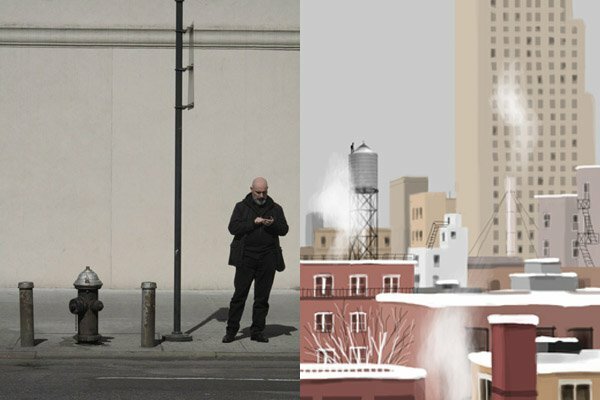 Colombo isn't sending emails or looking up directions, he's using the painting application to capture quintessential New York scenes — everything from silhouetted rooftop water towers to the illuminated Chrysler Building at night. This fall, in partnership with , Colombo released a collection of his illustrations titled and is debuting his first solo exhibition in New York City at . What follows are our favorite illustrations from the book with Colombo's captions. But first, an excerpt from the introduction by 20x200 founder Jen Bekman. 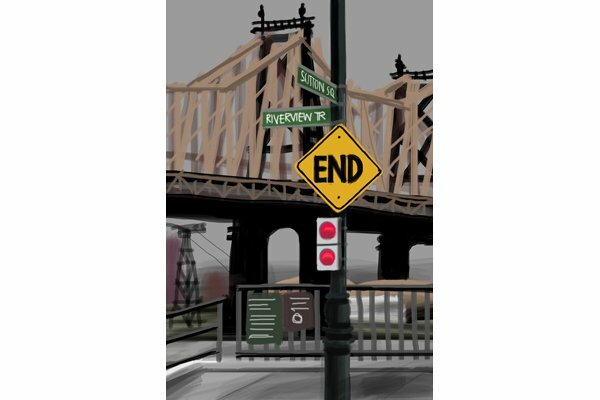 "The Iconic New York of now-classic films is what drew Jorge here to begin with, and now he finds himself as those auteur heroes of his used to be — his drawings pull from the energy and inspiration of the real city that he has immersed himself in. I can easily imagine him as an island in the stream of New Yorkers and tourists, sketching on his phone at some of the busiest intersection of the world. One of the things I love about traveling is that the feeling of being a tourist remains with me for quite a while after returning home — it's the closest thing to that new New York experience. Accustomed to being disoriented, I don't quite snap back into habit right away. Instead, I find myself looking up and around, scanning the skyline and plotting my paths more deliberately. It always makes me fall in love with the city a little more. Cutting through Cooper Square one evening not so long ago, having just returned from a trip abroad, I looked up to see the Empire State Building aglow in the earliest-of-evening light. Noticing it then, it became fixed in my mind. I imagine that it'll stay there for a while, reminding me of feeling at home and in love with where home is. If you were to ask me to describe that image, I'd tell you that the picture dwelling there is no perfect snapshot. There's no way I could explain it in words or draw it myself, but I can tell you with absolute certainty that it looks a lot like one of Jorge's sketches." В интеренете нашел авторитетный web-сайт на тематику http://ukrterminal.kiev.ua. Поможем вам подобрать и солнцезащитные очки в любом городе.